Ideal for racing or cruising allowing reduced diameter lines for easier and lighter rope handling. Dyneema, size for size, is the lightest technical fibre in production. Stripping the smooth 32 plait cover allows further weight reductions by 65% while retaining strength, stretch and wear characteristics. Tapering the cover on Spinnaker Sheets for example, means less weight at the Clew to let the Spinnaker fly higher. However, the cover needs to be retained for handling around Winches. The 12 Strand Dyneema core is coated with Marlow's new Armourcoat to improve adhesion between core and cover giving outstanding performance in Clutches and Jammers and improving abrasion resistance when uncovered. 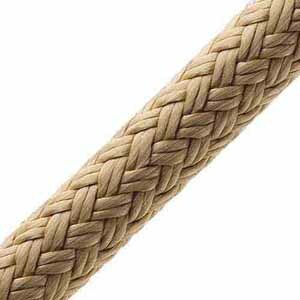 Due to the characteristics of this rope, we are unable to complete a double-ended splice (i.e. a splice on both ends) on any rope less than 5 metres.